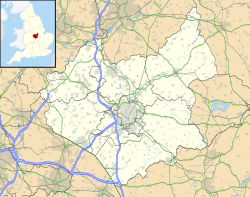 Holy Cross Priory is a Roman Catholic Dominican priory in Leicester, England. The priory was established in 1882. By 1929, the church had proved too small and Friar Vincent McNabb O.P. began to raise money for a new church. The choir and transepts of the church was completed by 1931, and the High Altar was consecrated. The church was finally completed and formally consecrated in 1958. The priory has had two church organs. The first were built by J Porritt & Son of Leicester in 1861. It was moved to the south side of the choir when the first part of the new church opened in 1931. The organ was, however, too small and difficult to play, and so a new organ was brought. The replacement came from St Mary's Church in Preston, Lancashire, and was built by William Ebenezer Richardson in 1880. The friars preach in the village of Woodhouse, at the University of Leicester, De Montfort University and Leicester Royal Infirmary and teach at Blackfriars, Oxford. ^ a b c "Priory of the Holy Cross". The Dominican Friars – England & Scotland. Archived from the original on 10 November 2013. Retrieved 27 June 2013. ^ "About Us: The Organs". Choir of the Priory of The Holy Cross. Retrieved 3 March 2019. This page was last edited on 3 March 2019, at 10:45 (UTC).